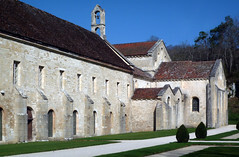 The Romanesque abbey of Fontenay (Abbaye de Fontenay) is located in Burgundy, France and stands today as a prime architectural example of the Cistercian order. Who are the Cistercians, you ask? The Cistercian were (and still are) monks that broke away from the mainstream Benedictines (specifically the Cluniacs), at the end of the 11th century. They are sometimes referred to as the white monks, a reference to their clothing (habit)—a deviation from the Benedictine’s black robes—or as Bernardines, after Cistercian superstar Saint Bernard of Clairvaux. 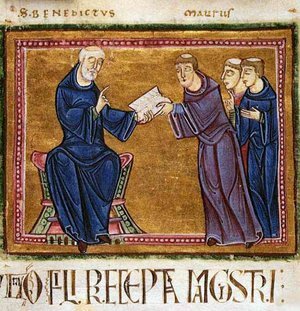 Essentially, the Cistercians felt the Benedictine monks had become too worldly and were no longer staying true to the Rules of Saint Benedict of Nursia. The Cistercians thought that the amount of time being devoted to manual labor was lacking. 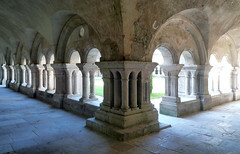 The goal of the Cistercians was to adhere strictly to the 6th century Rule of Saint Benedict. This Rule pronounced that a monk should divide his day equally between prayer, study and manual labor, as well as live a life of poverty, chastity and obedience. Most Cistercian abbeys were built to reflect this dedication to the Rule of Saint Benedict, with manual labor being an integral component. 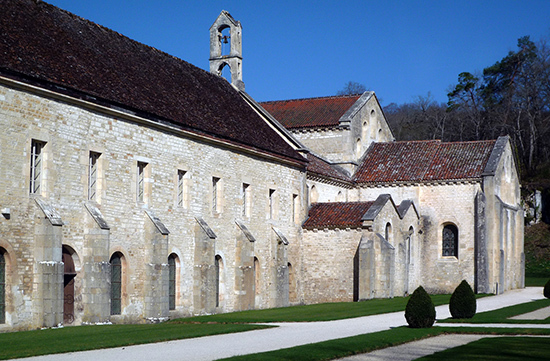 Fontenay, a fairly early addition to the order, and built directly under Bernard of Clairvaux, is no exception. 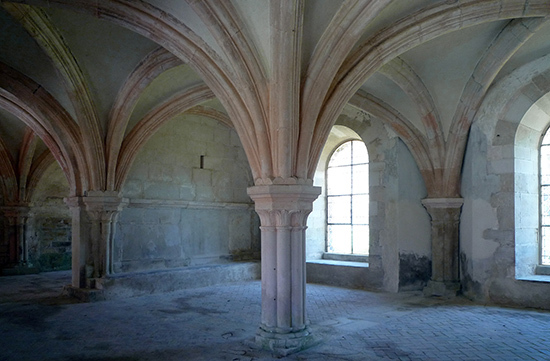 Fontenay was the second “daughter house” of Clairvaux, and one of the four founding houses of the order. Saint Bernard held strong beliefs as to how abbeys should be built and, as Fontenay was built under his auspices, it conforms to Saint Bernard’s dictates to a nicety. Cistercians chose to locate their abbeys in remote areas, far from any sort of hubbub that might interrupt their spiritual meditations. 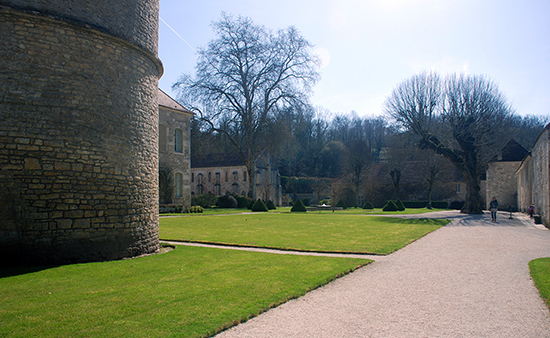 In Fontenay’s case, it was originally founded on the site of an old hermitage. However, due to issues with that site, the abbey was forced to relocate in 1130 to its present location further along the marshy valley. 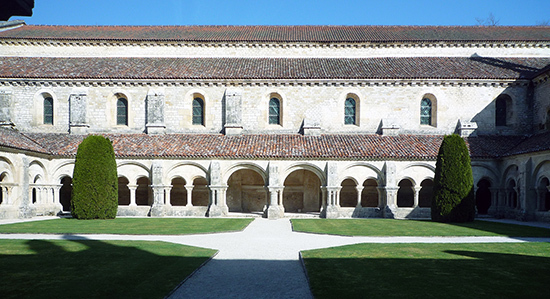 Often Cistercian would take an inhospitable topography and make it livable, such as the marshy site of Fontenay. 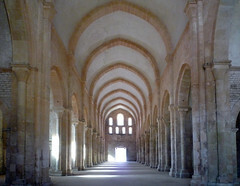 The Cistercian abbeys focused on complete self-sufficiency, and were akin to mini-towns, rendering the outside world obsolete. Ironically, given the success of the abbeys, they often became the economic hub of the area. 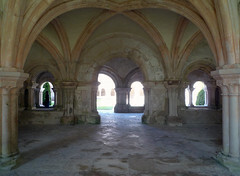 Cistercian abbeys were similar to those of the Benedictines, possessing a dormitory for sleep, a cloister for strolling, a chapterhouse for the monks’ morning meeting, and a caldarium, or warming room where the monks could read and transcribe (also sometimes referred to as a scriptorium). 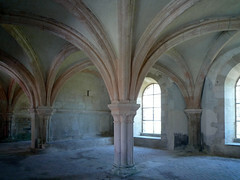 However, an additional feature found at Cistercian abbeys was a wing for lay brothers. 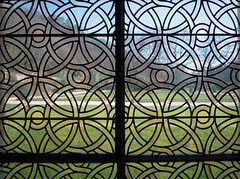 Unique to the order, and one of the reasons for its popularity, was the fact they would allow lay men to join. These men were required to adhere to most of the rules of the order but their lives were slightly less strict, and lay brothers could never be ordained or hold office. 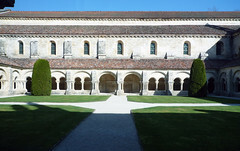 Fontenay today is remarkably well preserved, though the refectory (cafeteria) was destroyed and the gatehouse restored the 17th century; repairs have also been made to the roof. The abbey still possesses its medieval forge, with its tremendous hydraulic hammer. The forge was an important producer of iron tools and building components in its day. The Cistercians were known to take an austere tone when it came to ornament. 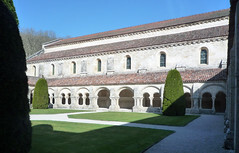 Bernard of Clairvaux felt decoration, whether in the church or in the cloister, would detract from the monks from their heavenly ruminations. With this in mind, Bernard also nixed the crossing tower, which was a common feature in other Romanesque churches, but something Saint Bernard found ostentatious and excessive. A small bell can be found on the roof, as it was a necessity for calling the monks to mass. 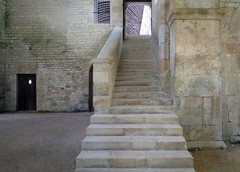 The Cistercians did, however, lavish acute attention on the construction materials, the stones of the church themselves, generally only using the finest of ashlar masonry. One enters the church through a singular portal almost completely devoid of ornament aside from the beautiful pink and brown coloring of the stones. The church is in the form of a Latin cross. The east end consists of a flattened apse flanked by two matching square chapels—a deviation from the more common semi-circular apse. 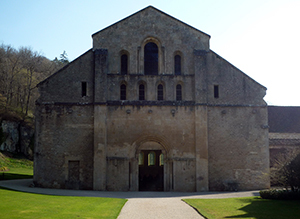 Fontenay was dedicated in 1147, making it one of the oldest Cistercian churches in France. 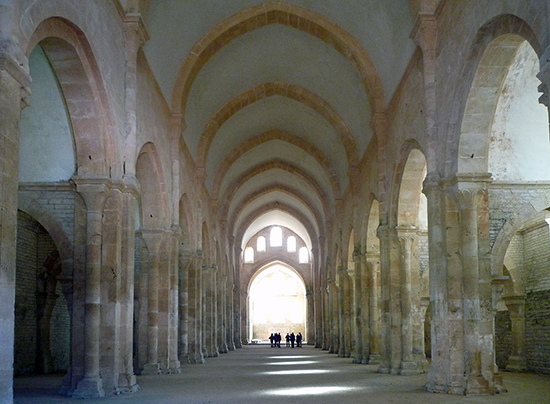 When a visitor enters the church, they are confronted with the symmetrical beauty that is quintessential to the Cistercian abbey. The harmony of proportions might almost make one think of a Classical Greek temple, or the work of later Renaissance architects such as Alberti. Cistercian architecture did inspire Le Corbusier, pioneer of modern architecture. 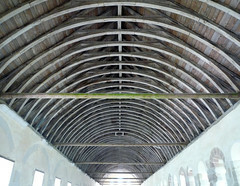 The eight bay nave is flanked by aisles on either side. There is no clerestory. 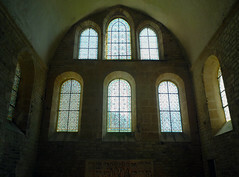 Light only enters from the side aisles on the right, the windows at the east and west ends, as well as windows that pierce the East wall of the crossing transept. 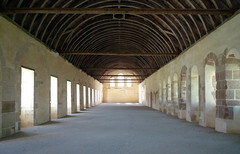 The nave is a rounded barrel vault, ever so slightly pointed and the side aisles are likewise supported by barrel vaults which are perpendicular to the nave. Engaged columns coursed into the nave wall connect to the transverse arches above to produce a quiet visual rhythm. 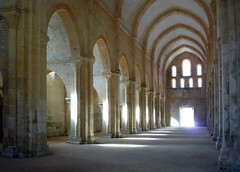 As is the case with a number of Cistercian abbeys, the church at Fontenay anticipates the Gothic aesthetic in the way that the barrel vaults are gently pointed. 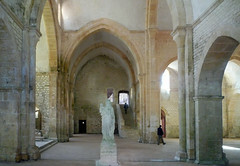 Like so many abbeys, Fontenay was seized during the French revolution, at which point it ceased to function as a religious center. The property was auctioned off and it became a paper mill in 1791. Later it was be adapted for other industrial purposes until purchased by Edouard Anyard, who restored its structures to their original purity. It remains in the Anyard family to this day, and is open to the public for all to see. It stands as a sober, yet stunning, reminder of the reductive beauty of Cistercian architecture. Cite this page as: Christine M. Bolli, "Fontenay Abbey," in Smarthistory, August 8, 2015, accessed April 20, 2019, https://smarthistory.org/fontenay-abbey/.